How anything survives these Minnesota winters still amazes me. Nevertheless life continues whether we look around and acknowledge it or not. 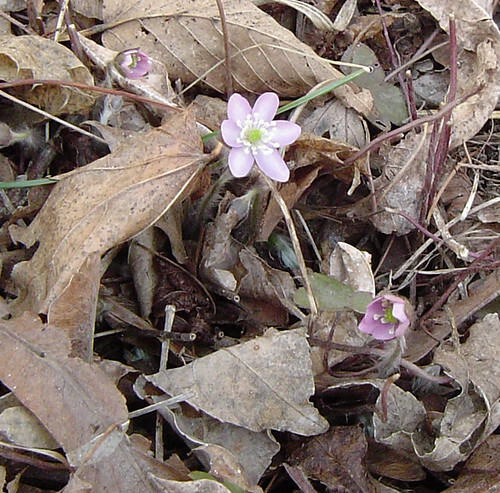 The first bloomer in our yard is the tiny, delicate Hepatica flower. 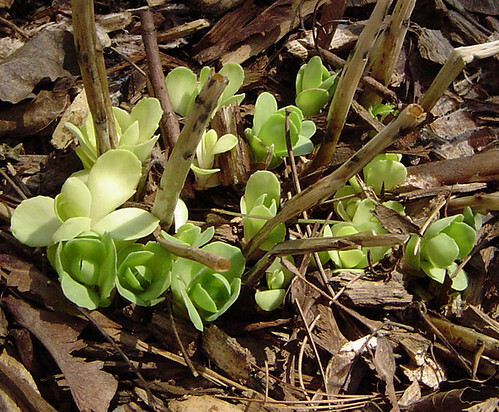 Not to be outdone, though, Sedum sure makes a statement as its first leaves provide a striking contrast to the grays and browns of the garden beds. Those aren’t the only things emerging from a period of rest. 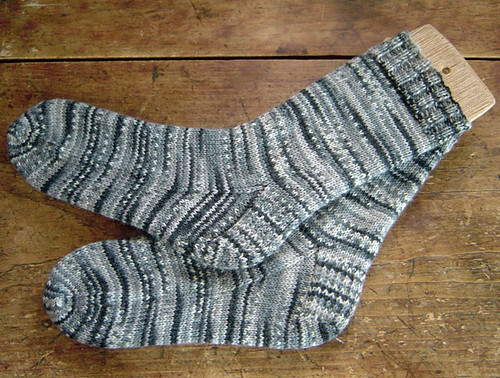 Virginia finished up a pair of socks after a tiny hiatus* of a couple of weeks. (* Hiatus is a relative term, since for me I’d consider it a break once we’ve reached the 6-month mark). And, for those of you with keen memories, there might be one or two other socks in the collection made from the same Regia yarn… there are only so many choices out there. if i may request… a finished photo of V’s crochet blanket. i know she is finished cuz she said so. but she didn’t bring it in so that i could “oooh” and “aah” properly. Do you KNOW how much your flowers piss me off as I sit here under 2 FEET of SNOW that fell in the last couple of days? The poor geese are getting ready to fly south again. You and your stinkin flowers!!! !